Pumpkin Pie and Halloween Fun! This Halloween is the first Halloween I didn’t dress up in years (unless you count throwing on a Batman cape for school), and I’m not gonna lie… it was nice. Every year I’d have to think up costumes, spend a bunch of money, and complete a bunch of DIY stuff for it. Don’t get me wrong, it was fun and the costumes were awesome, but it was tiring too. This Halloween I ended up making a pumpkin pie from scratch with Ban instead. I used a recipe from the Food Network and it turned out pretty great! 2. Cut the pumpkin in half and clean out the seeds and stringy parts. 5. While the pumpkin is baking, prepare the crust by combining the flour, salt, and butter with a fork until crumbly. 7. Divide the dough in half (putting one half in the refrigerator to use later), and place it on floured wax paper. Roll it out to 12 inches round and then place it in a pie dish. Stab the dough with a fork all over and refrigerate it for 15 minutes. 8. Take the pumpkin halves out of the oven. Place foil on top of the pie crust and weigh it down by pie weights or dry beans. Then, place it in the oven for 12 minutes at 350 degrees. 9. While the crust is baking, peel the skin off of the pumpkin halves and place the pumpkin meat in a food processor or blender and puree it. Then combine the pureed pumpkin with molasses, cinnamon, ginger, canola oil, salt, eggs, condensed milk, cream, and corn starch (add in 3/4 c brown sugar if you don’t use the pumpkins labeled for pies). 10. When the crust is done baking, pour the mixture from step 9 into the pie crust and bake until the middle is set (about 1 hour). Cool for 30 minutes. The pie part was ridiculously tasty! Which was to be expected since it was rated as a 5 star recipe. The crust was a different story though. It was super thin and hard and not tasty at all…. so I would recommend using a different crust recipe. Maybe a 5 star one! 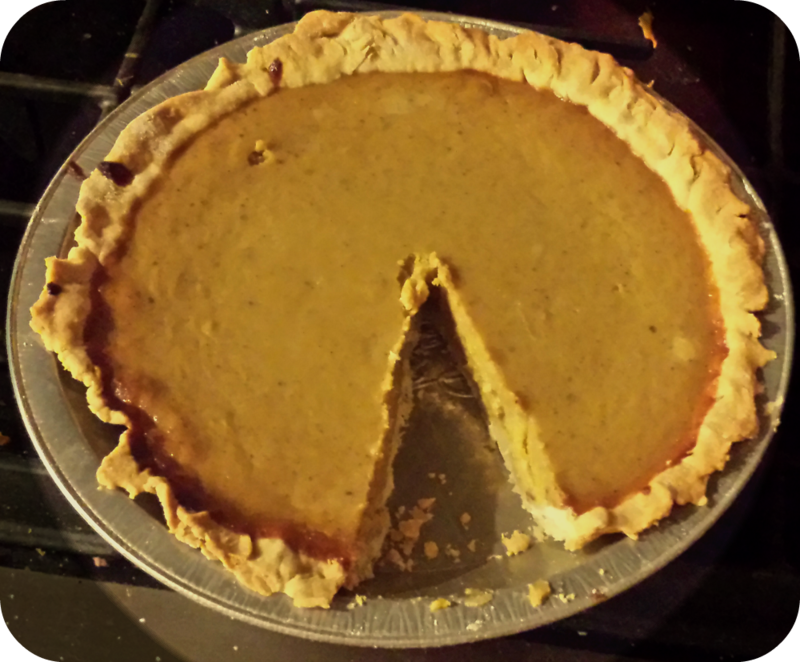 Overall though, it was a good experience making a pumpkin pie completely from scratch. Oh, and did I mention that Ban, Aiko, Matt, and I all carved pumpkins about a week prior to Halloween? I forgot how much work carving pumpkins is! Do you dress up every Halloween? ?